Yes those are Atropos and Porphyrion Imperial Knights in the back. 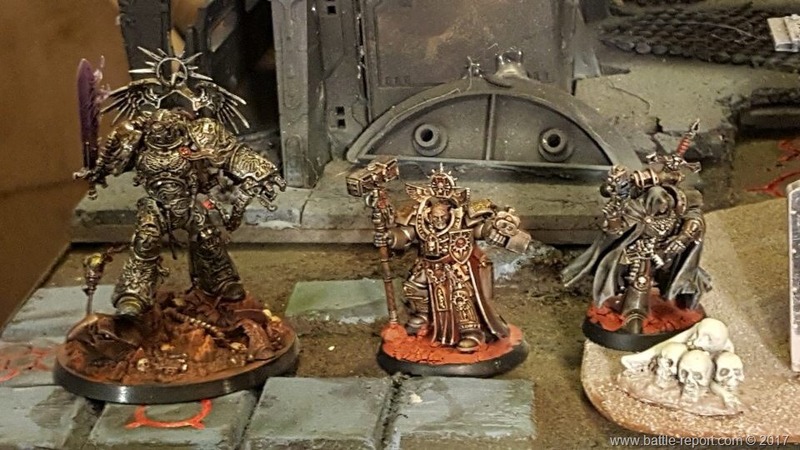 And yes, those are Roboute Guilliman, Primarch of the Ultramarines Legion, Grand Master Voldus of the Grey Knights and Cypher the Fallen Angel in the front line. 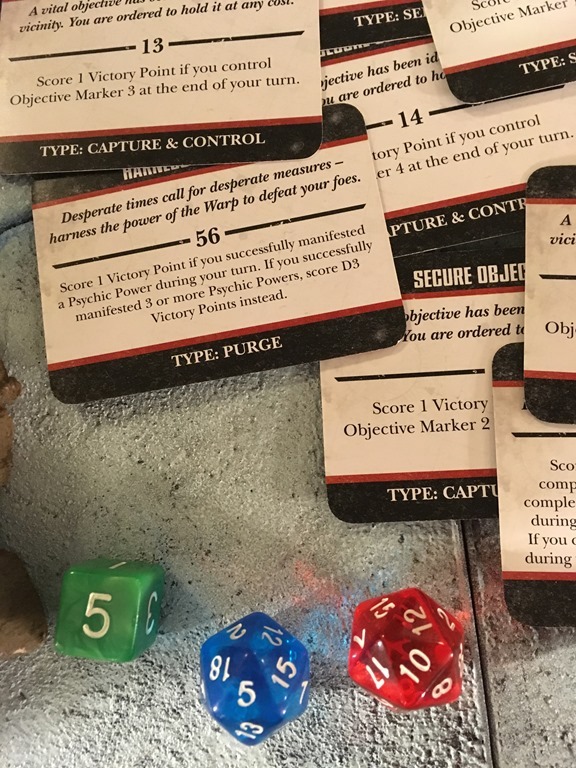 Forces of Imperium won the roll off and deployed and went first. 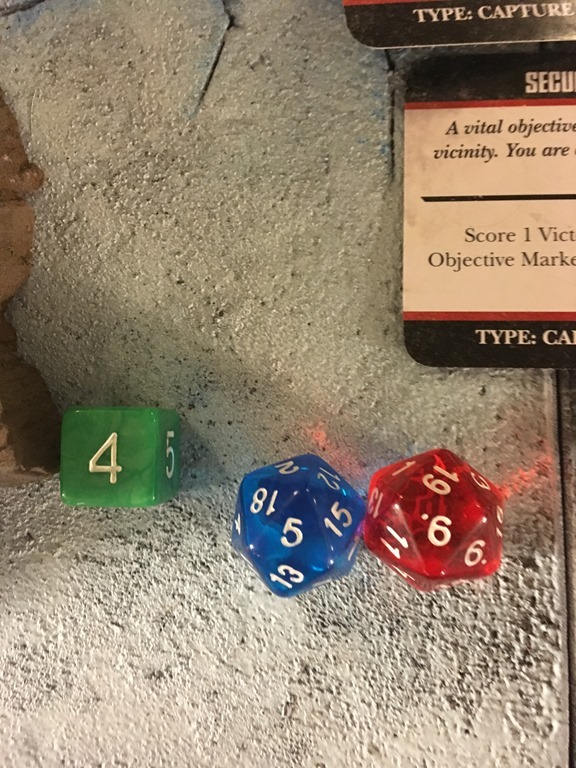 Forces of Chaos attempted to Seize the Initiative and rolled a 6 on the fist try. 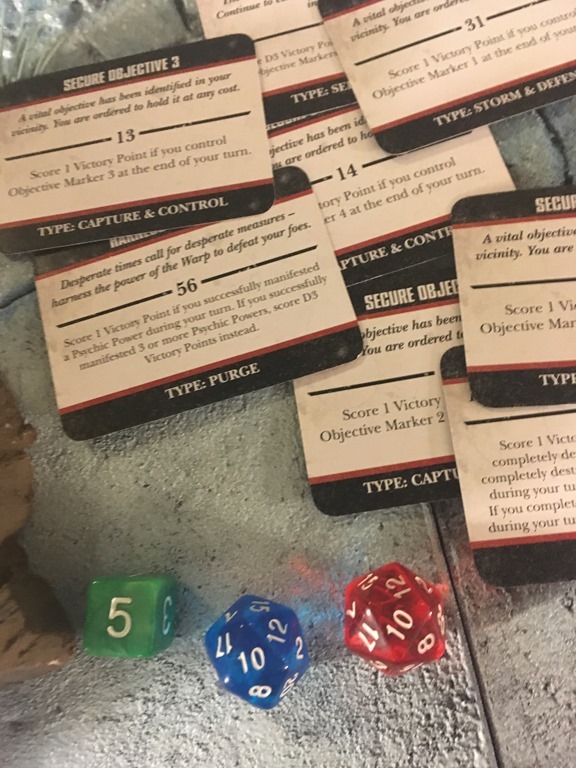 However, due to some special rules/warlord trait’s shenanigans they were foced to re-roll the first result of Seize the Initiative and rolled a 3. 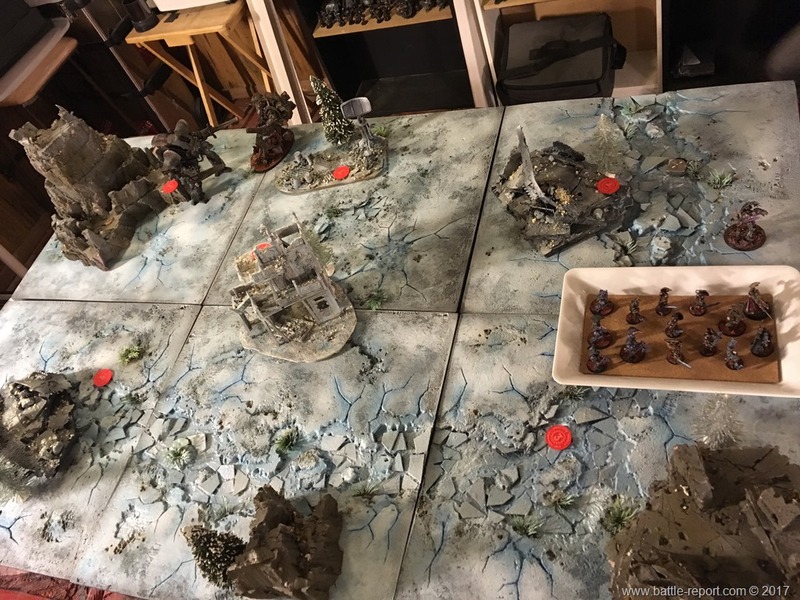 Imperium Turn 1! 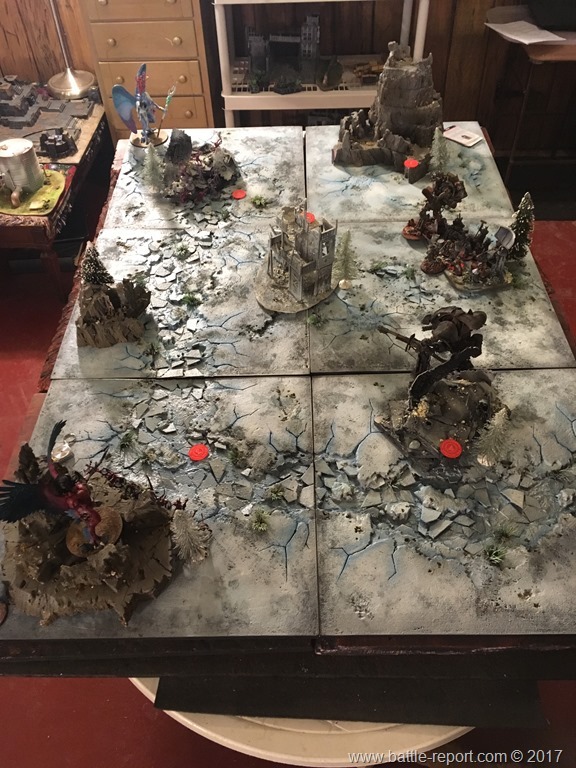 During the movement phase one of the Imprial Knights moved up towards the center of the battle field. 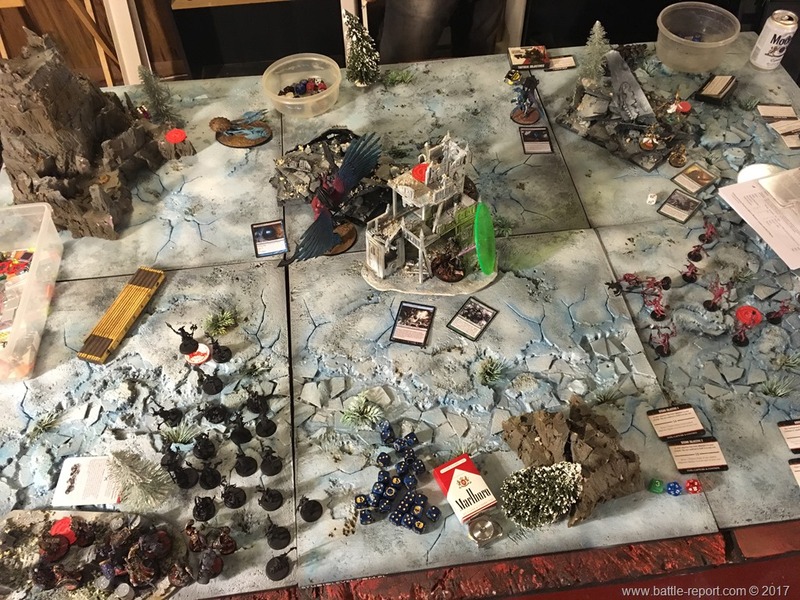 The other Knight, Roboute Guilliman and the rest of the models suspiciosly huddled together on the tiny piece of terrain at the top center of the board. 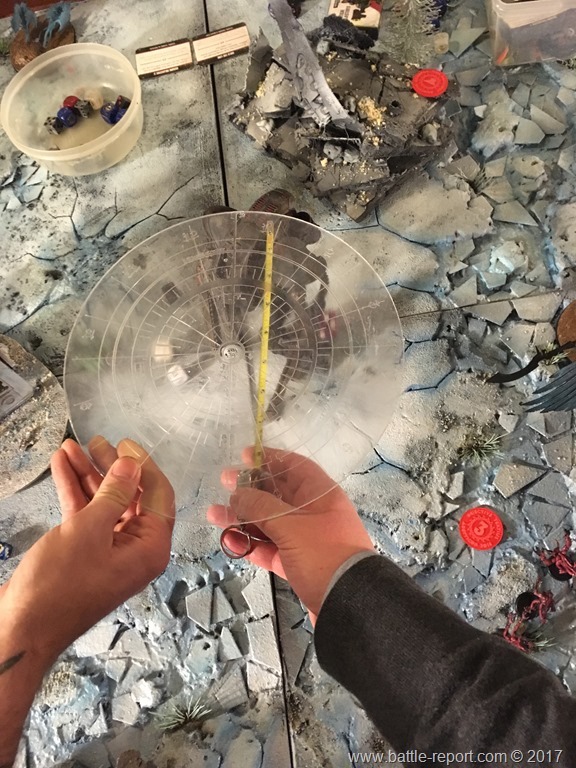 During the psychic phase they were able to successfully manifest the Shifting Worldscape psychic power, which allowed them to move the piece of terrain (they were all on) 24” closer to the Daemon Lord of Tzeentch. Then came time to shoot. Magnus suffered a wound from the Knight Porphyrion but was not grounded. 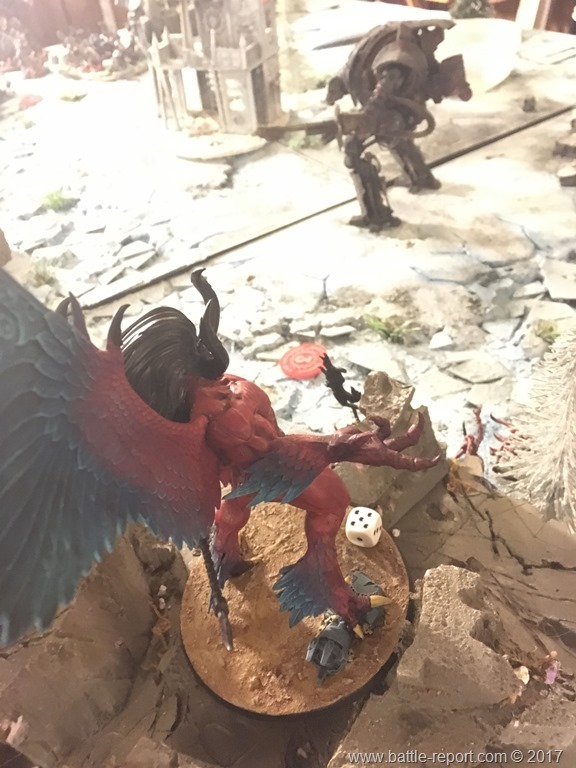 Aeraos’rau’keres also suffered a wound but was on on the ground to beging this turn anyway. 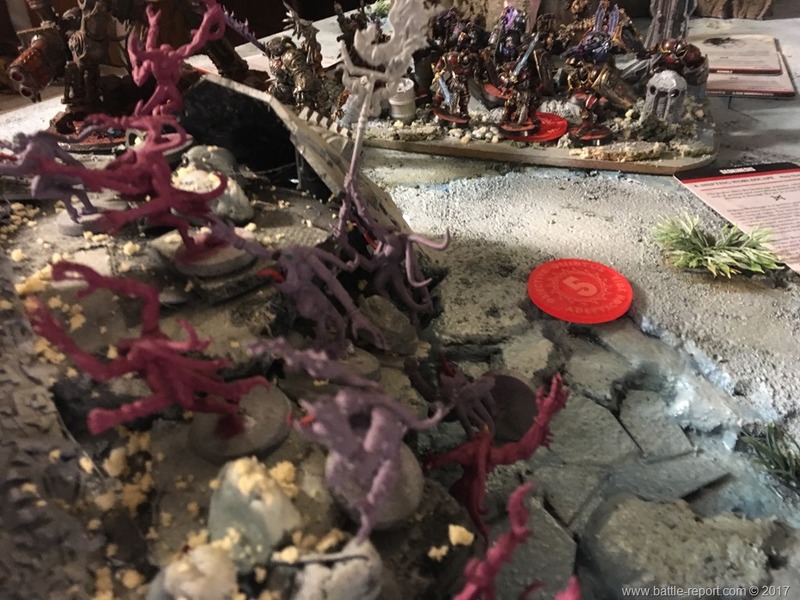 Then the Forces of the Imperium inexplicably started shooting at the Pink Horrors of Tzeentch, causing many casulaties and forcing them to split into Blue Horrors. 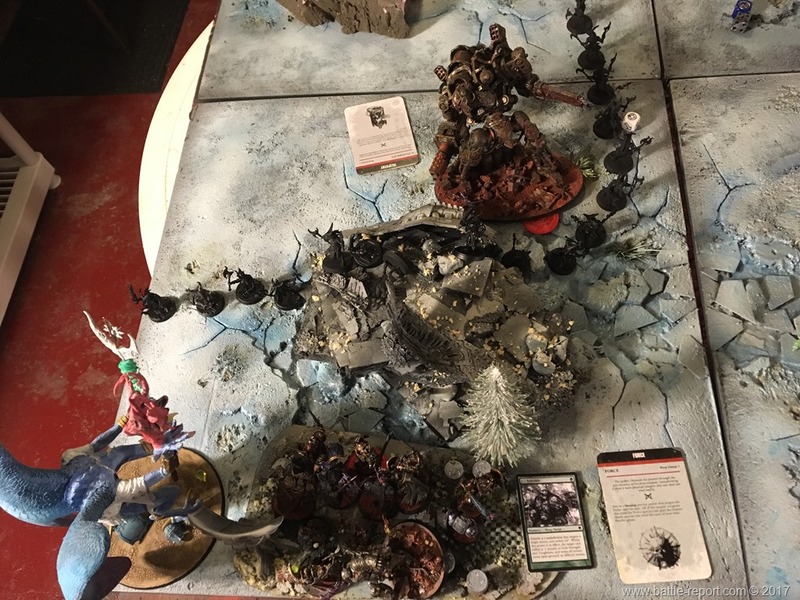 Newcomers to the battle field spawned 6” away from where they died used their bodies as meat shields to prevent Guilliman and his buddies to charge the Daemon Lord. 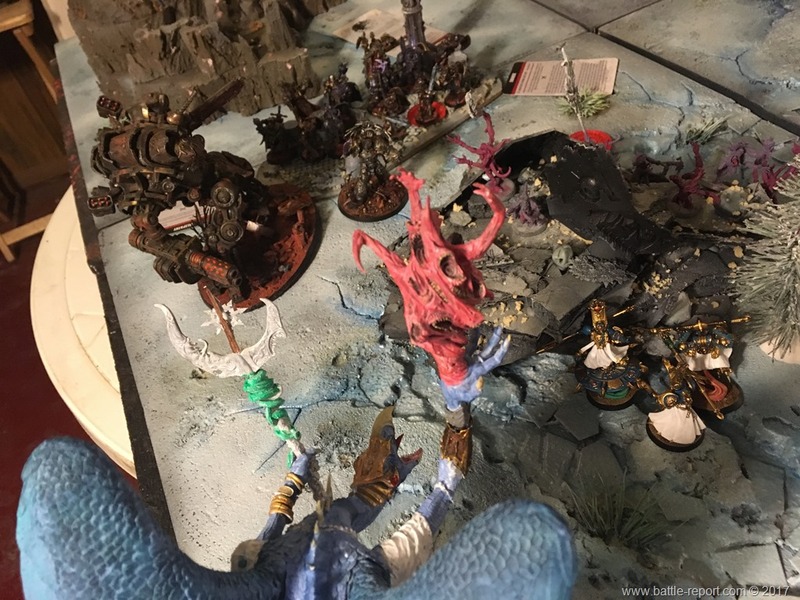 Yes they look like unpainted Tzaangors but they’re actually Blue Horrors! 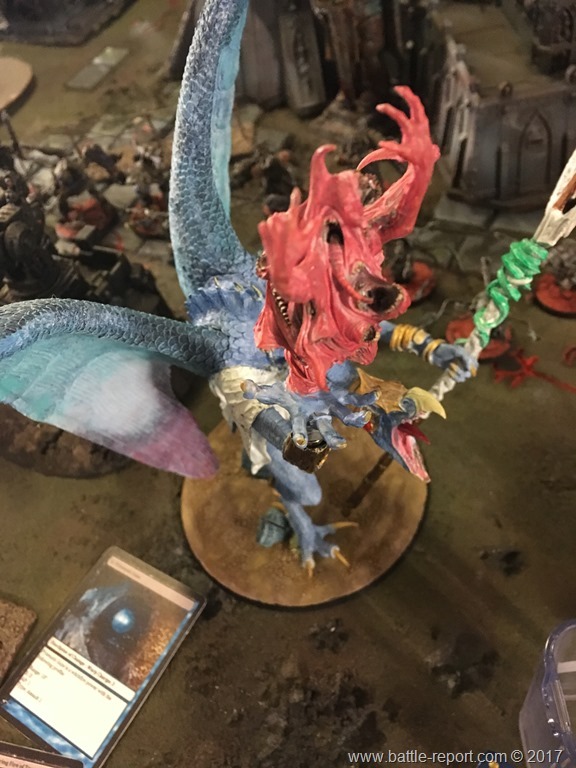 Eventually all the Pink Horrors died from shooting and were replaced by Blue Horrors of Tzeentch. 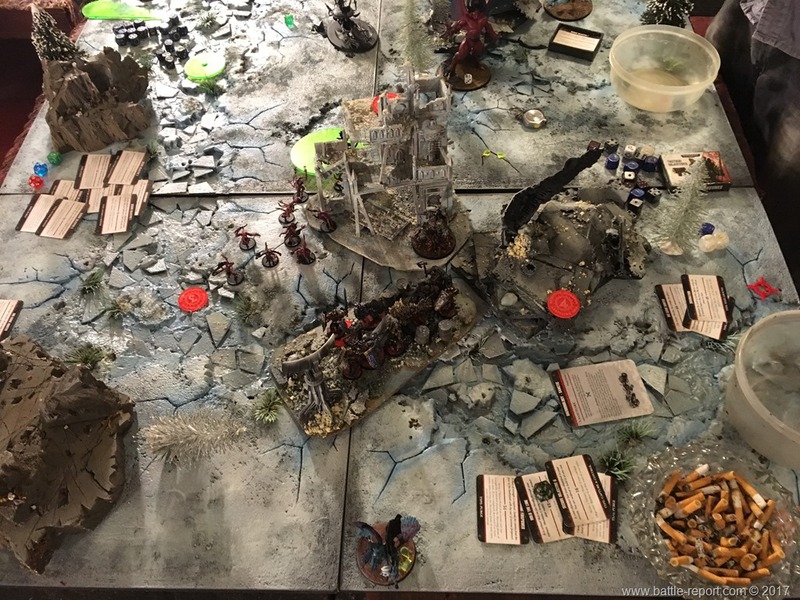 At the end of their turn Guilliman and friends were in the lead 2:0. 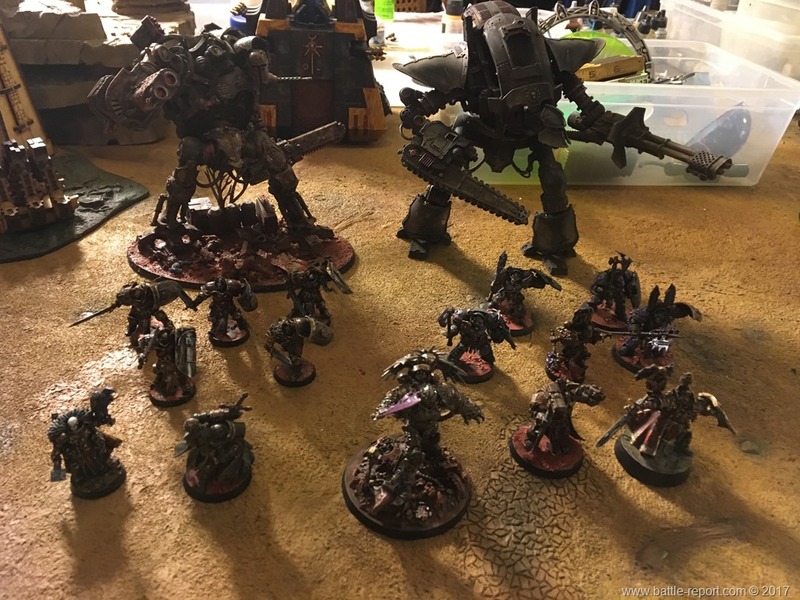 Magnus and Kairos zoomed up the field to get behind the Imperial Knight. 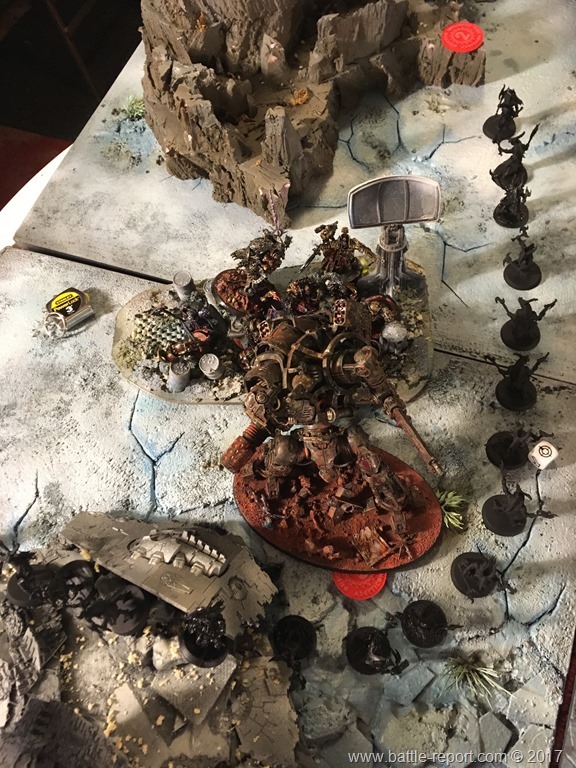 The other unit of Pink Horrors moved to hold Objective Marker 3. 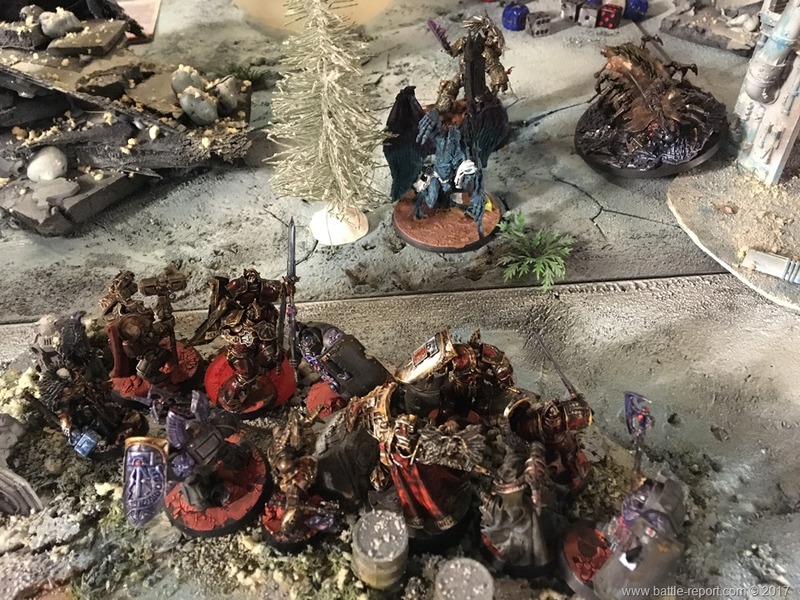 Exalted sorcerers moved towards the center of the battlefield. 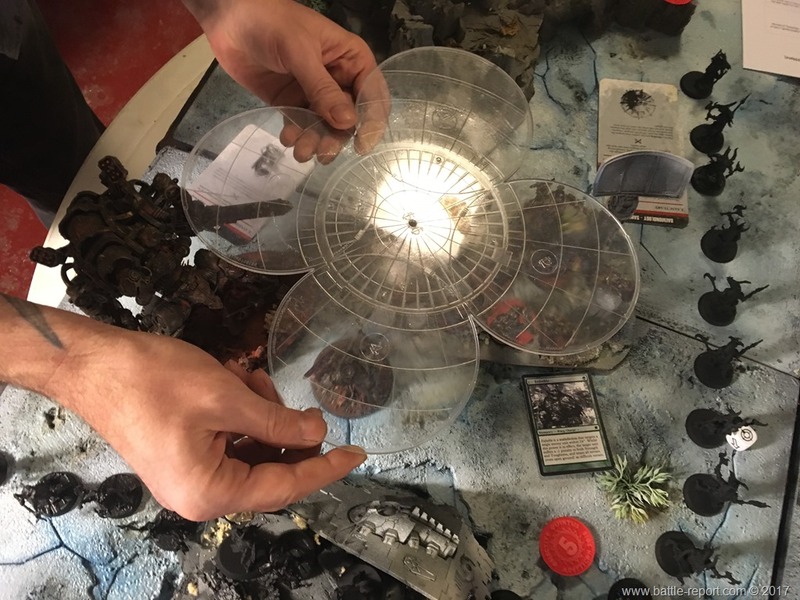 During the psychic phase Magnus manifested Prismatic Gaze and took away one Hull Point from the Porphyrion followed by Gaze of Magnus that took caused 3 more Hull Points of damage. 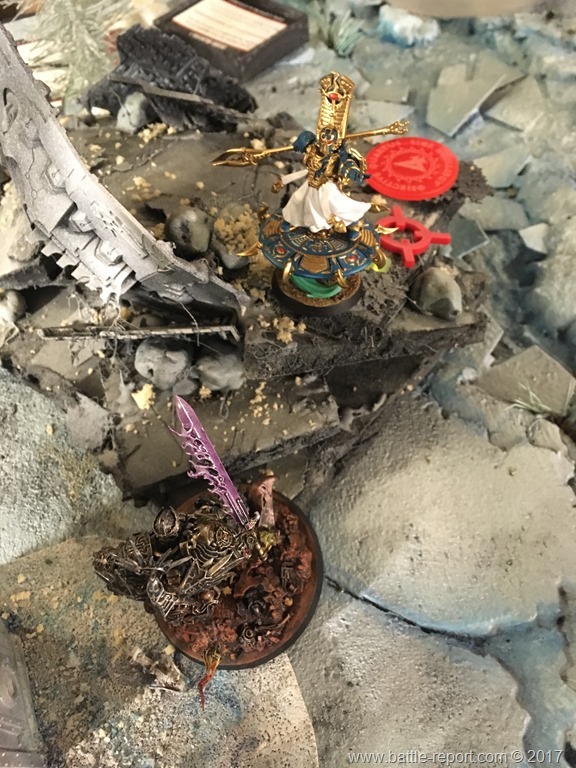 In addition, he manifested Boon of Flame and conjured up a Burning Chariot of Tzeentch which unfortunately suffered a Deep Strike mishap and was placed elswhere by the opponent. Scrapcode Curse finished of he Imperial Knight which resulted in a glorious exlosion that caused no damage to anyone. 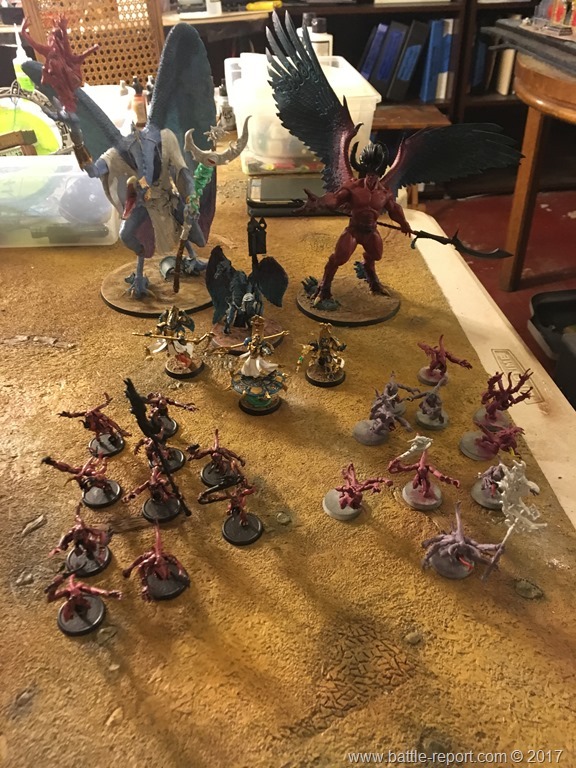 Exalted Sorcerers cast Enfeeble on the big blob of Imperial models to prepare them for the Apocalyptic Barrage from Aeraos’rau’keres. 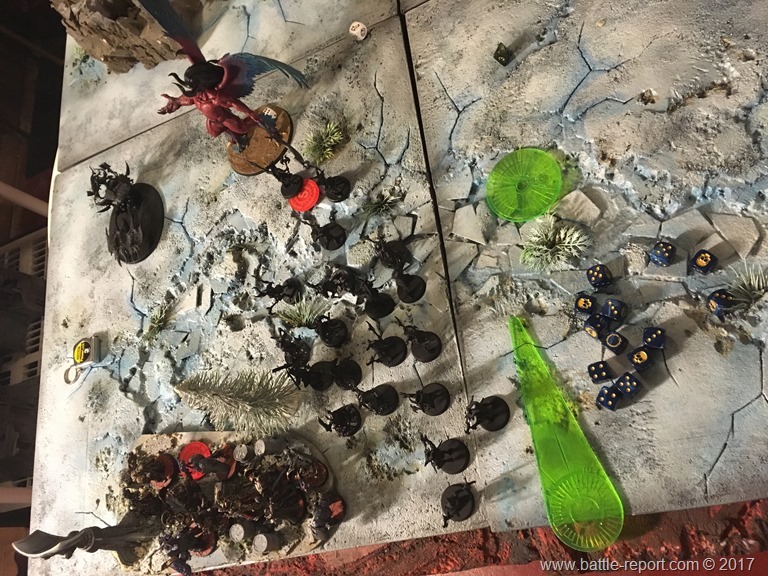 Even though Daemon Lord’s shooting attack landed numerous hits, it caused only a few wounds. 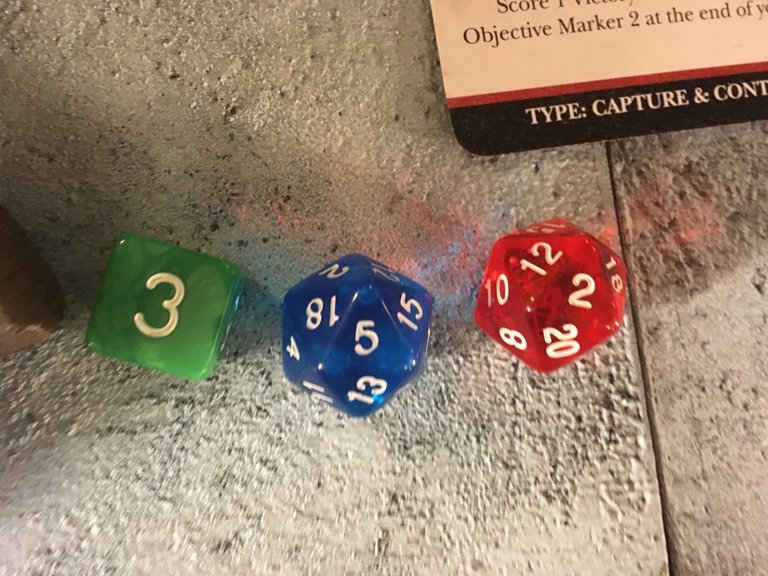 Cursed 3++ Invulns! 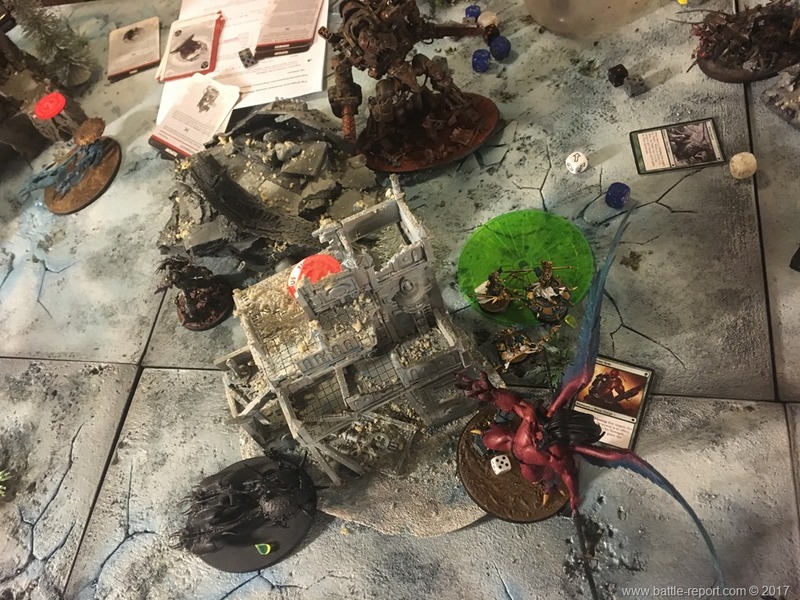 Iron Armed Sorcerers choosed to run to grab the Objective Marker in the center of the board, and the Crimson King and Fateweaver flew straight towards Objective Marker 4 during the shooting phase. 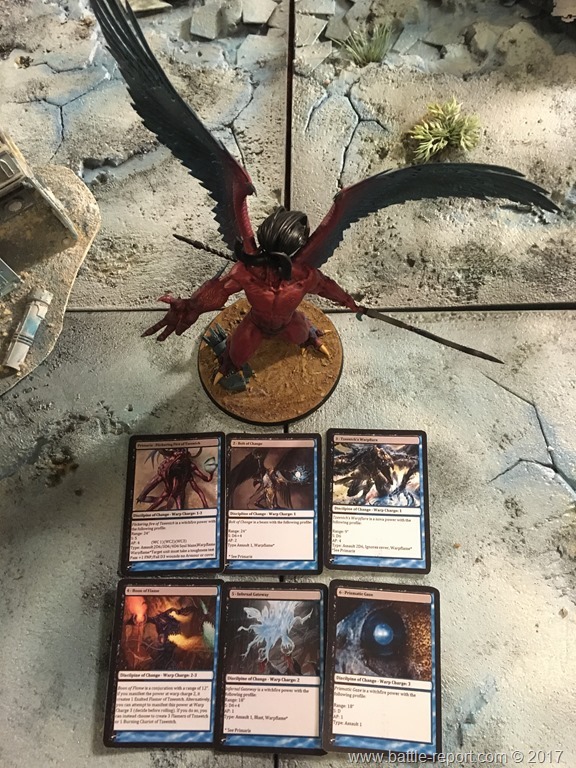 At the end of Turn 1 Sons and their Tzeentch associates were able to score just one Victory Point for a result of 2:1. 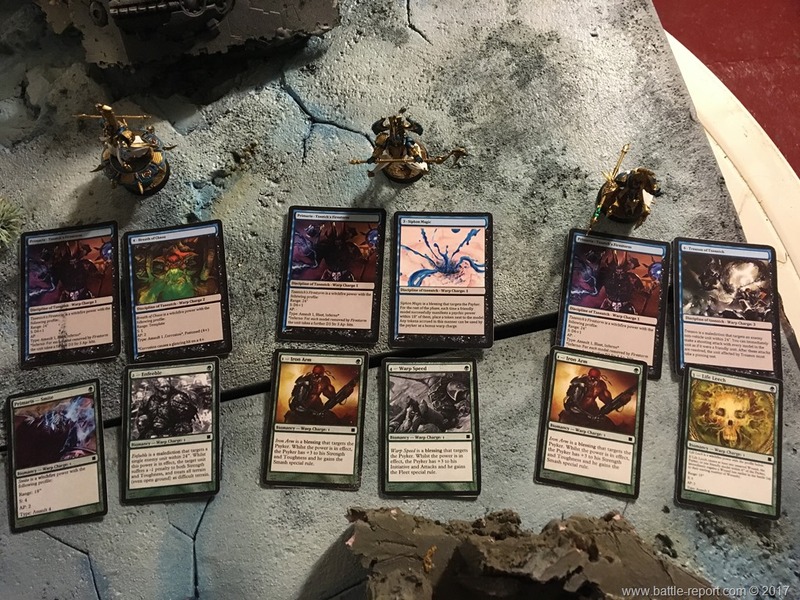 Guilliman’s boys drew the following Tactical Objective cards. 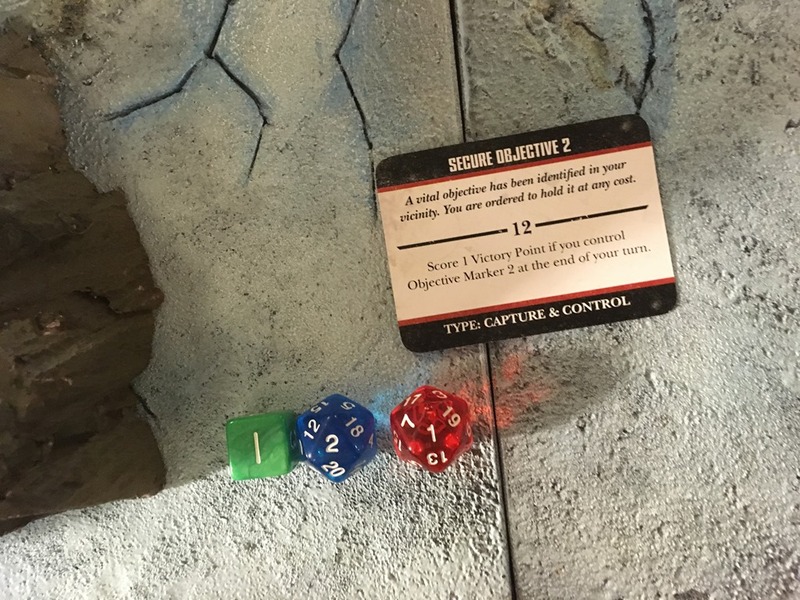 During the Movement phase Atropos moved towards the closest Objective Marker. 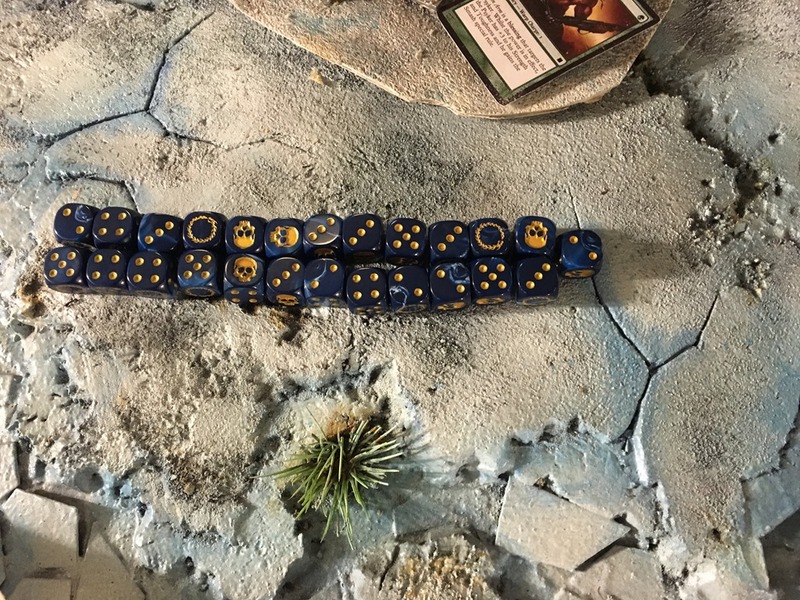 Even though Thousand Sons rolled all of these dice to Deny the Witch, Imperium was able to cast of another Shifting Worldscape. 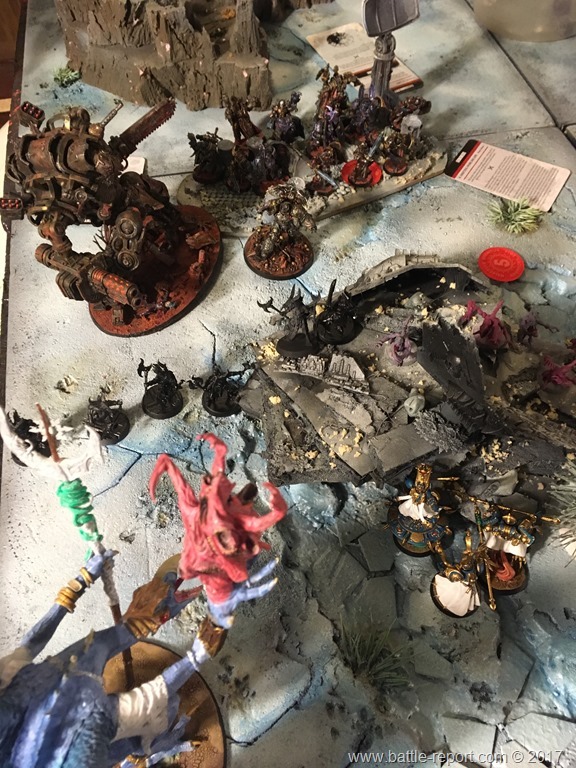 That landed the pirce of terrain with pretty much the whole army right next to their biggest threat – Daemon Lord of Tzeentch. 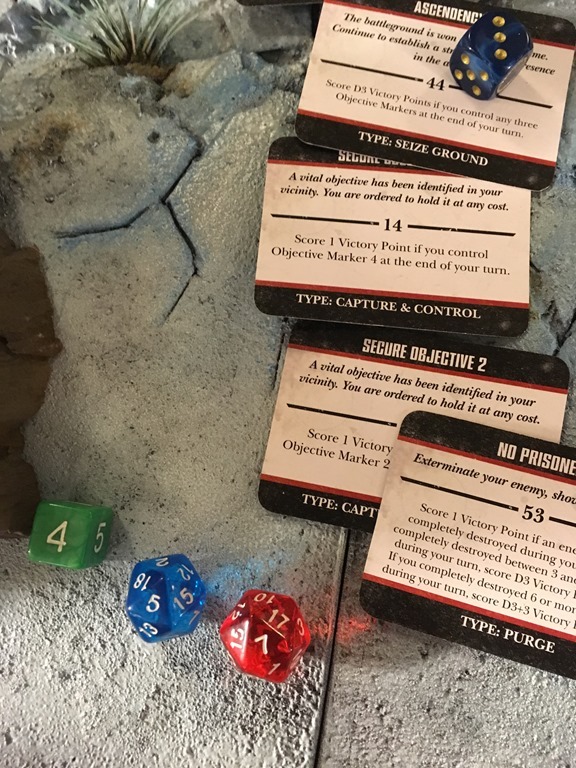 Next, they manifested Force that enabled their close combat weapons to inflict multiple wounds on the enemy (immune to Instant Death). 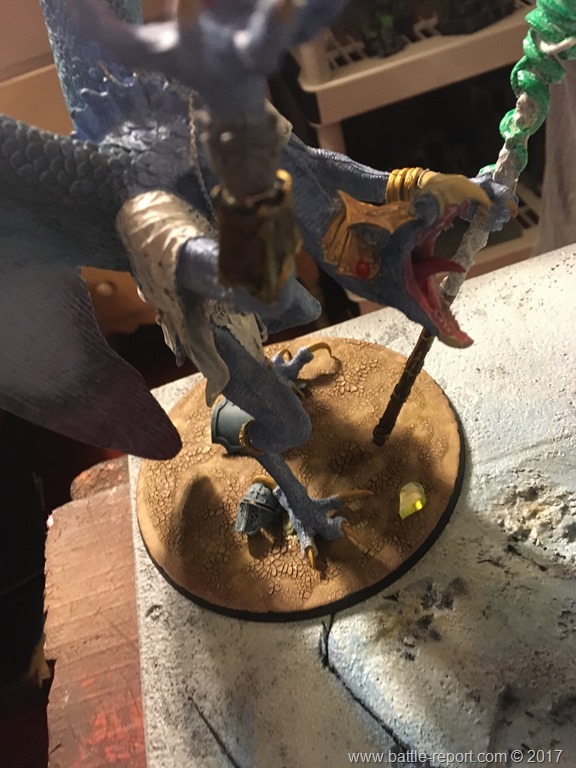 And then they charged the big bird. 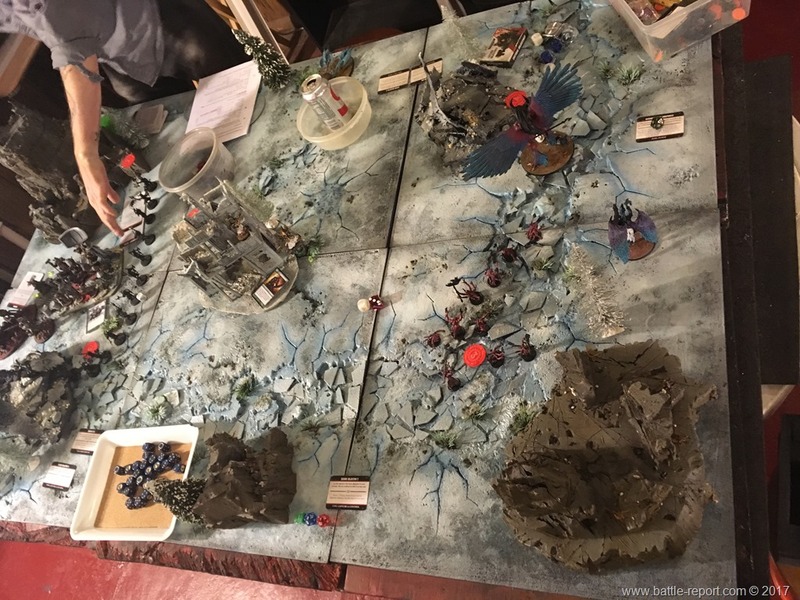 Through some additional shenanigans they were able to lower Aeraos’rau’keres’ Initiative down to 1 and attacked first. 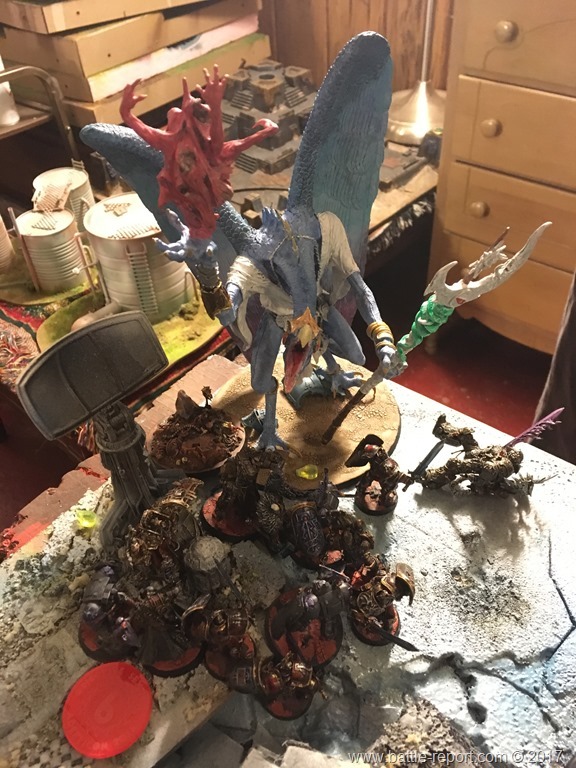 Tzeentch must have been looking the other way during the assault phase, because the big guy missed a bunch of 3++ rerollable 1 saves, and was banished back into the depths of the Great Ocean. 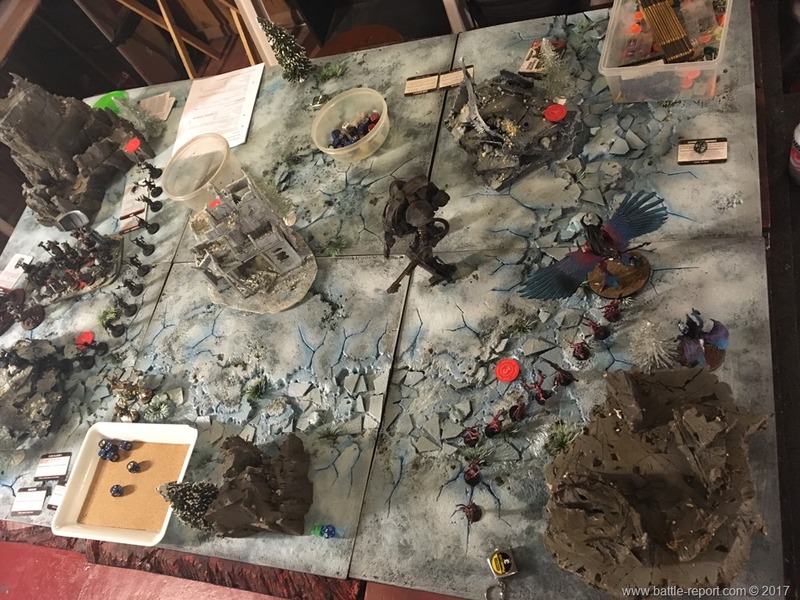 At this point Guilliman’s peeps were in the lead 3:2. 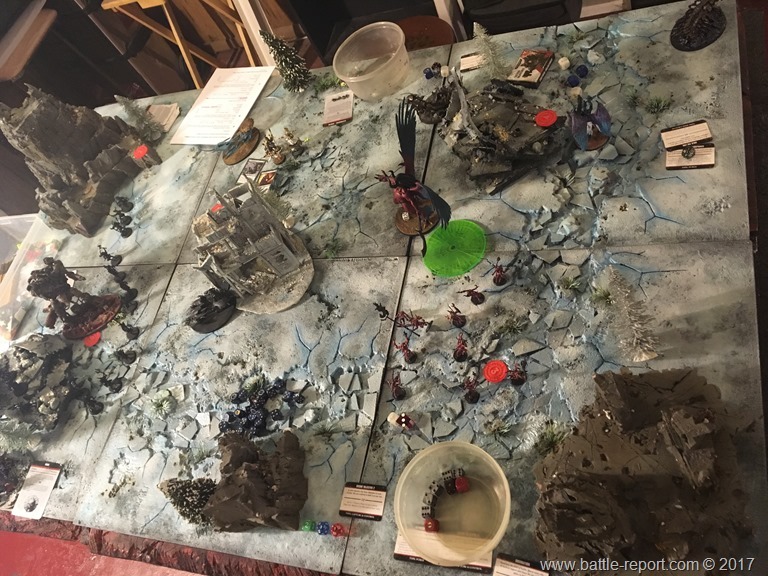 The Librarius conclave moved another piece of terrain with Guilliman and the Knight on it across the board, moving them closer to Magnus. 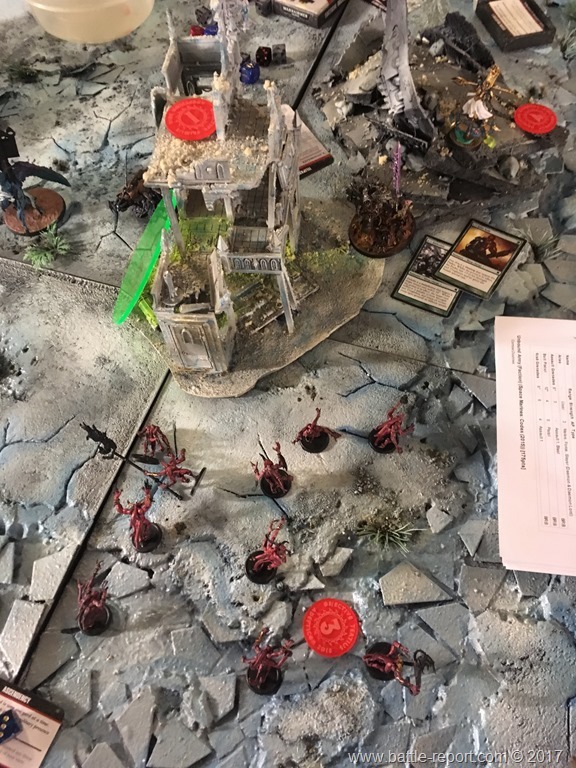 Oh, did I mention that there was a moving vortex on the battlefield as well? 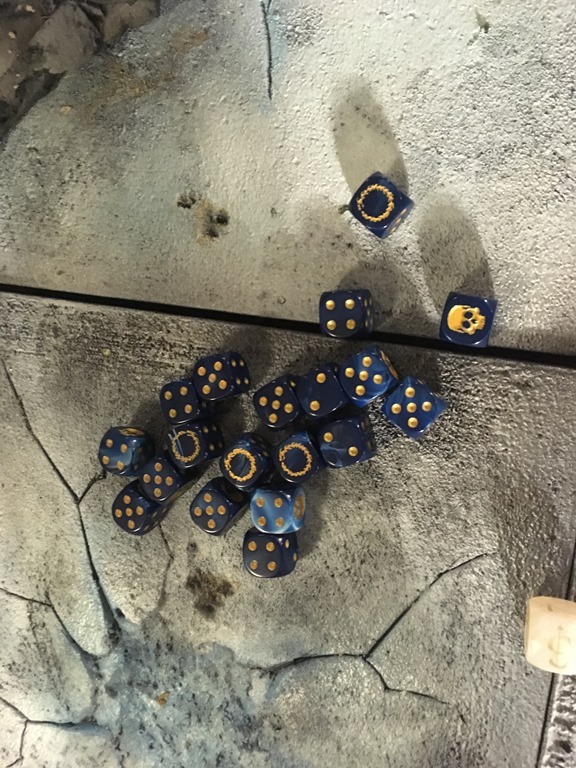 Well there was one, and the dice scattered it right on top of the Exalted Sorcerers. 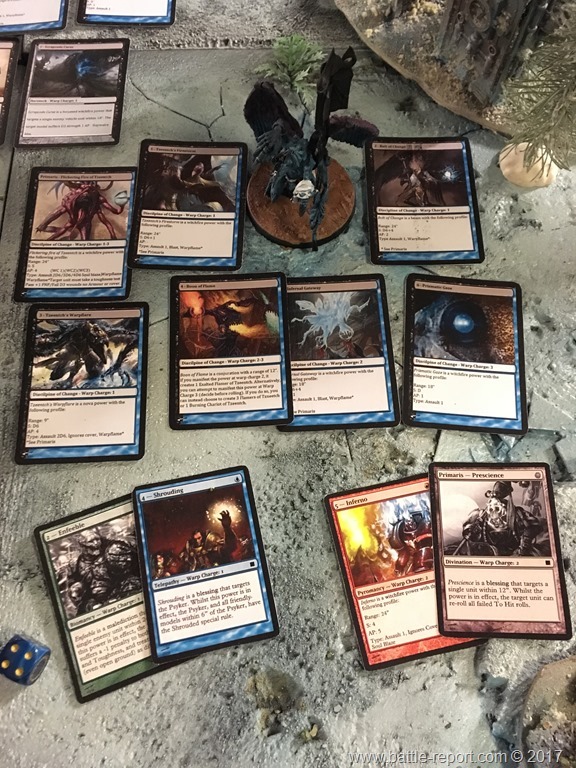 At the begginging of Turn 3 Sons were down 5:2. 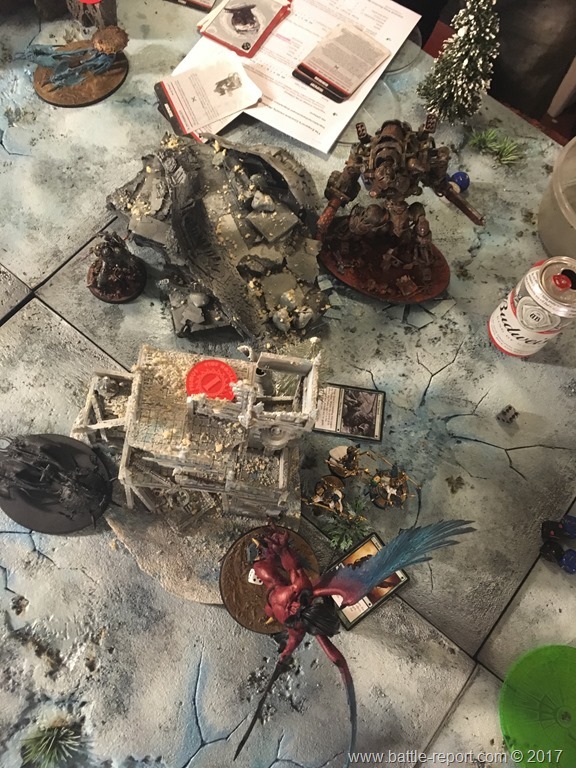 Between Magnus, the Fateweaver, and shooting from the Chariots, Chaos was able to take down the remaining Imperial Knight, as well as grab some Objective Markers for much needed Victory Points. 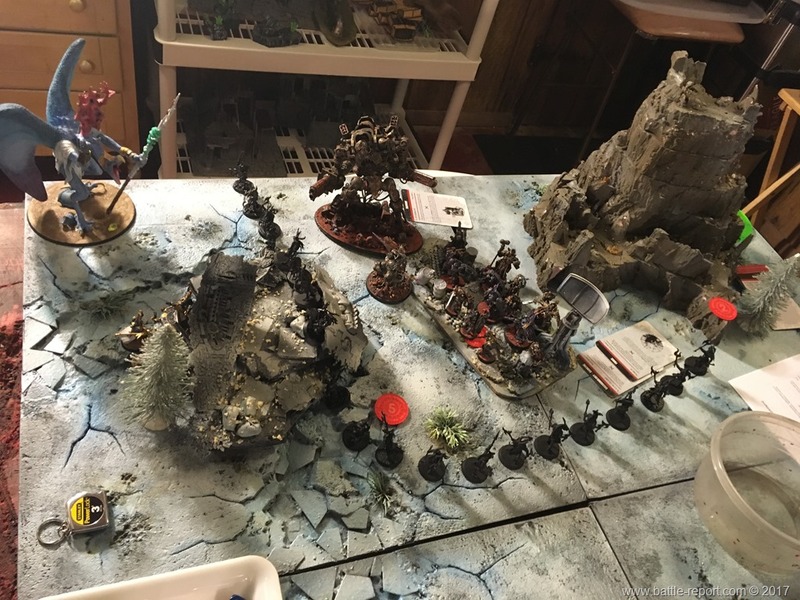 Turn ended with Forces of Chaos taking the lead. Score was now 5:6. 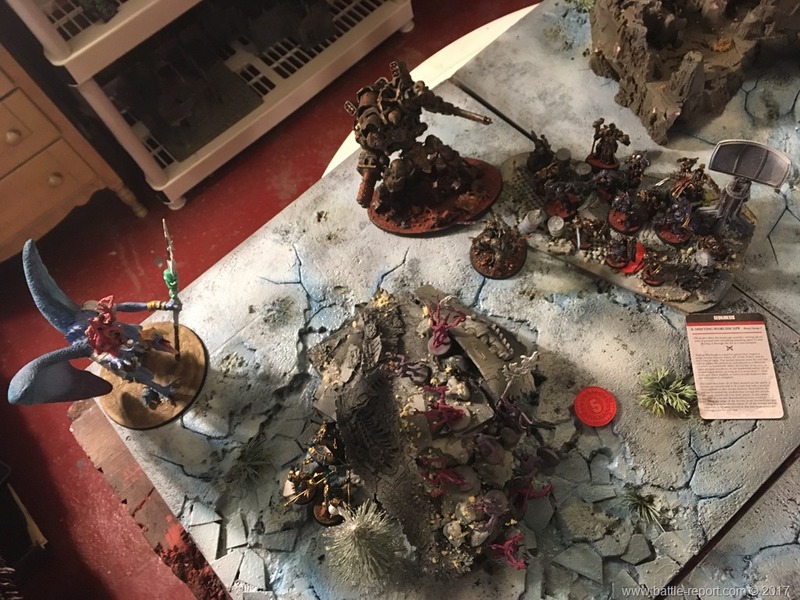 Exalted Sorcerers were staring down Roboute. 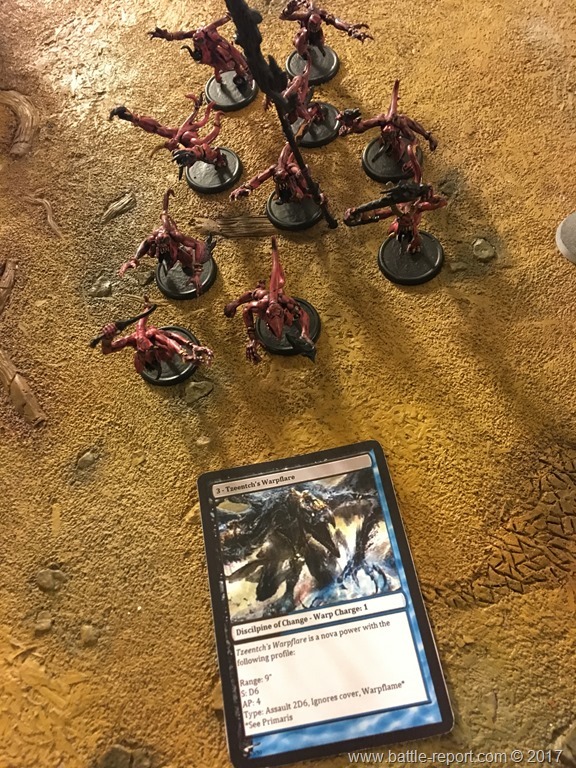 He did not appreciate that at all, so he charged them and gave them a proper whooping. At this point result was 5:6. 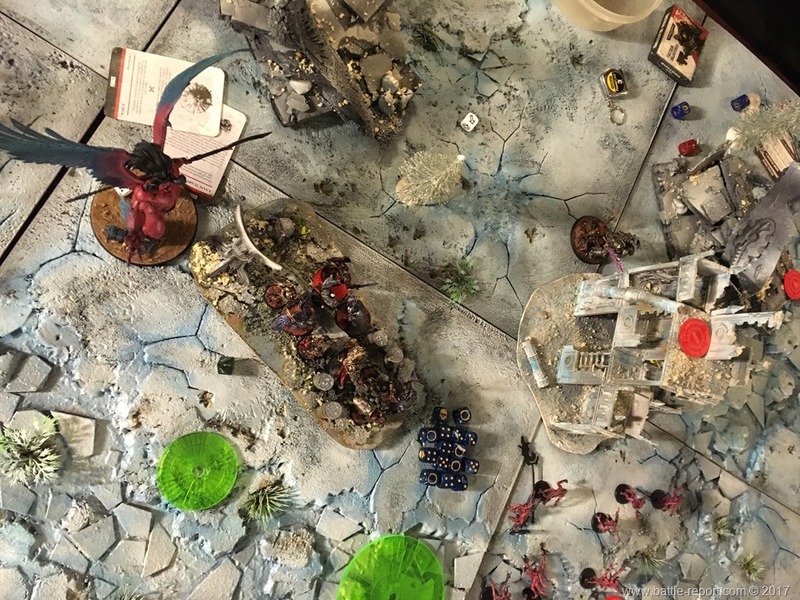 Guilliman was winning. 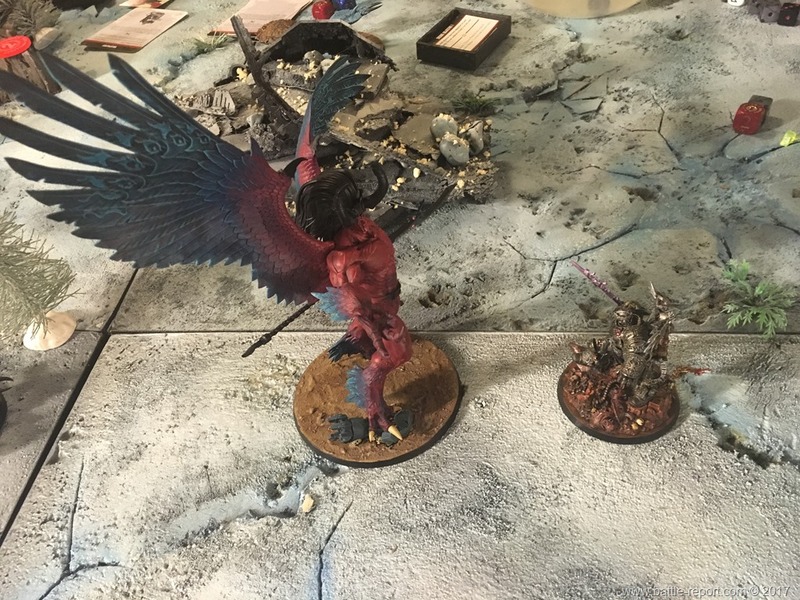 Seeing (with his one good eye) what Roboute was doing to his kids, he decided to return the favor and flew down a bit getting ready to smack some people around. 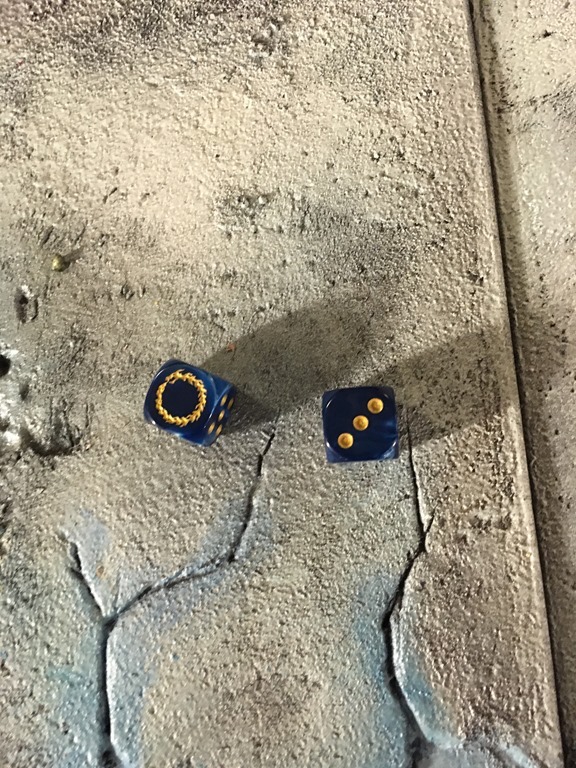 The last of the sorcerers locked in combat with the Ultramarines primarch died. 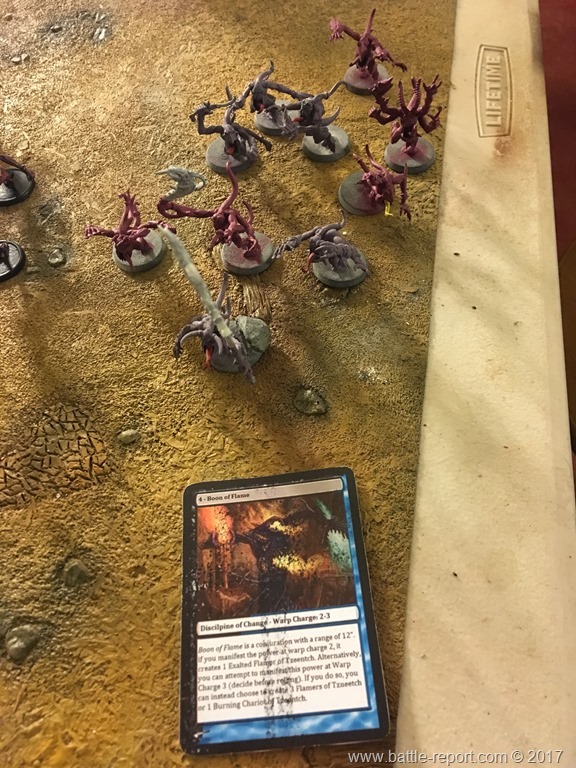 At the end of Turn 4 Tzeentch was smiling as his favoured were in the lead 5:7. 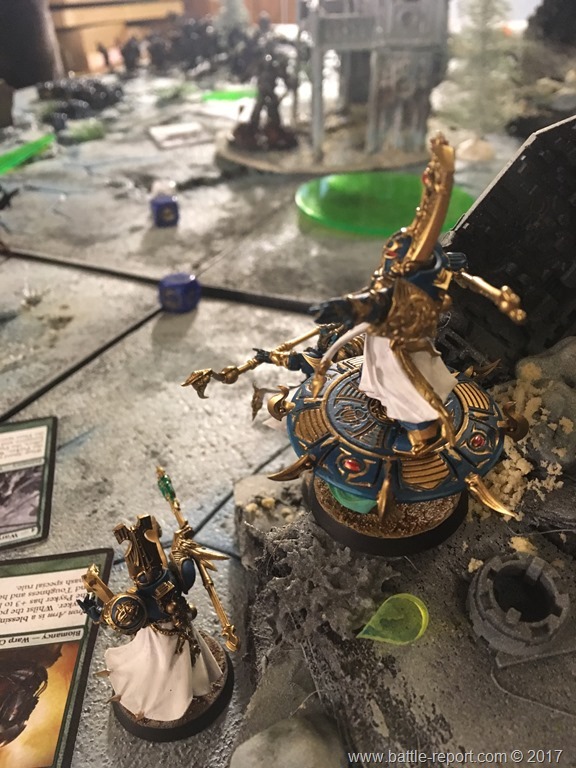 Guilliman went after the enemy’s Warlord – Kairos Fateweaver flanked by what looks like a Necron model but is really a Burning Chariot of Tzeentch (use your imagination!). However, Kairos survived even though he took multiple wounds and managed to stay in the sky. Then casually turned around and flew away. Big Red closed in looking to join the party. 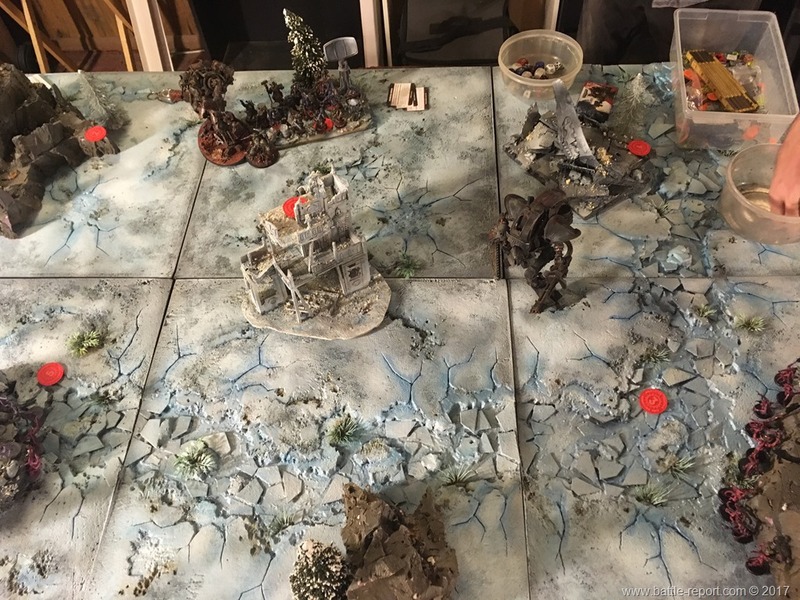 At this point, result was Imperium 5, Chaos 10. 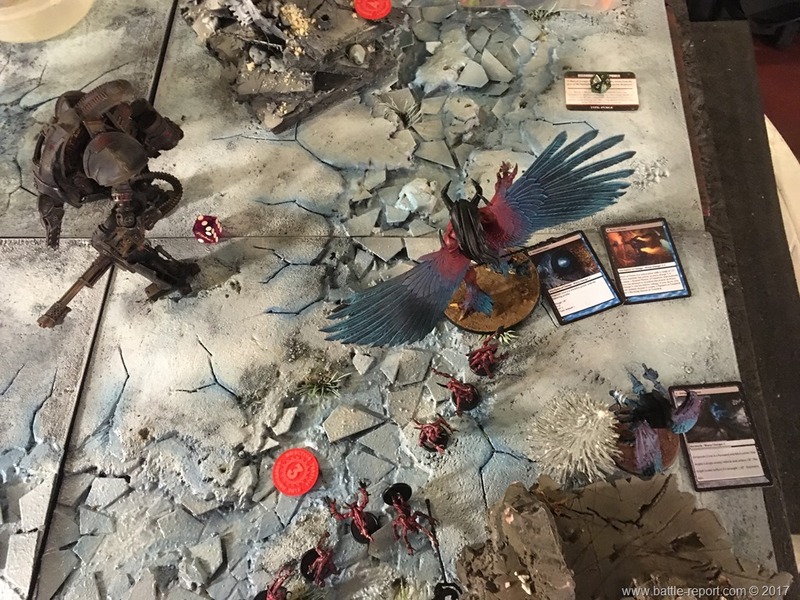 Kairos was doing everything possible to fly off the board, but Shifting Worldscape again, got the enemies closer and allowed them to shoot him down. 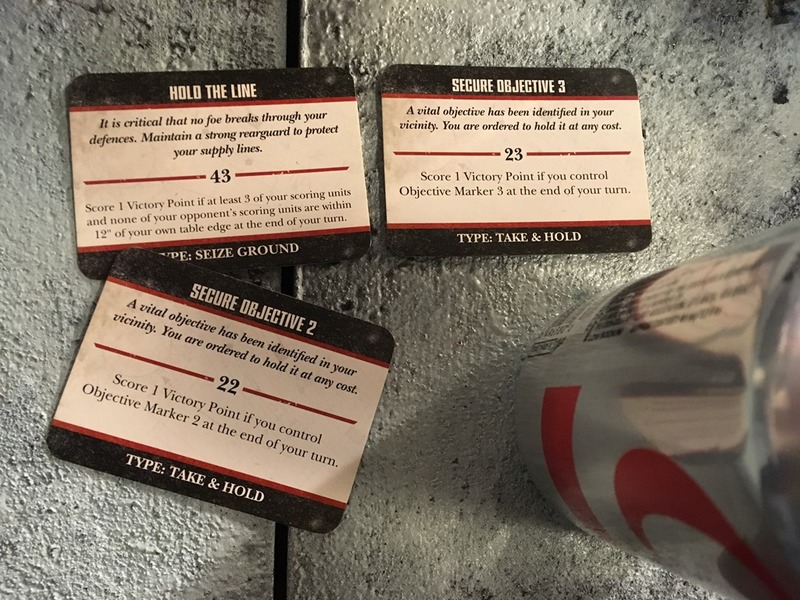 The game did not go into Turn 6.